Fringe favorite, starring in noteworthy solo shows Giant Invisible Robot, Boat Load and Fall Fair. That's an impressive resumé. 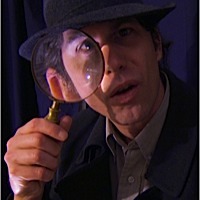 Gun Powder is a meta-parody of a who-done-it detective show and/or novel in which McDonald plays the victim (an actor named Jayson McDonald), the bumbling detective Thom Phox, and all the suspects (including a writer named, you guessed it, Jayson McDonald). This fast paced send-up takes every noir cliché and turns it on its head. The "dark and stormy night", for example, gets dissected by Phox's easily distracted narration, as he scratches his head in thought while at the same time pulling the rug out from under the audience's expectations. We may not know what's coming next, but whatever it is, we know it's going to be funny. All this cleverness is delivered as casually as one can imagine. The laughs come faster than a hail of bullets made from laughter... but not the deadly kind...because that would hurt...oh hell, now he's got me doing it. Note: Jayson McDonald's Gun Powder has been reviewed elsewhere on PLANK by Chris Felling when the show was performed last spring at Uno Fest. Gun Powder is part of this Victoria Fringe for more information shoot yourself here.